The Seventh Day Adventist Church is not a denomination which features very often on this site, but some of the buildings they worship in are notable for their former usage. This rather pretty little corrugated iron church will be a familiar sight to travellers leaving Bury on the Fornham Road, tucked beside the railway bridge and opposite Tescos. 'Tin Tabernacles' of this kind were once very common, being a popular and cheap way of erecting churches in newly built-up areas as the Nineteenth Century became the Twentieth. Many were produced here in East Anglia, at the huge Boulton and Paul works in Norwich. Easy to put up, they were also easy to take down again as patterns of worship changed, and few survive in use as churches in Suffolk. Elmswell Baptist church is another, and Holly Lodge Baptist church in Ipswich, although the latter is scheduled for demolition in 2008. There's also a Catholic chapel just over the Cambridgeshire border. They usually had a little spire or bell turret. This is no longer in place here, but you can see the square base where it once stood. The little dormer windows in the roof are a nice touch. Railway Mission churches were, by their nature, usually in areas of working class housing, and set out to provide a muscular protestant ministry to railway workers. Patterns of social housing changed, and some embraced a wider mission. 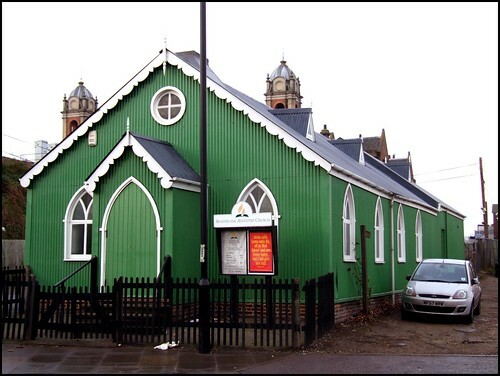 This particular building became the Fornham Road Free Church, an evangelical non-conformist community. The world continues to change, and today it is in the care of the Seventh Day Adventist Church, a denomination notable for marking the Sabbath on a Saturday rather than a Sunday. Many Seventh Day Adventists came to this country from the Carribean in the 1950s and 1960s, and the congregations have become established in most towns and cities. As weird and wonderful as their beliefs and practices might appear to my eyes, it's good to know that this little building is still cared for, and still in use.